Sturge-Weber syndrome, also known as encephalotrigeminal angiomatosis or meningofacial angiomatosis, is characterised in its classical form by a congenital, usually unilateral, 'port-wine stain' (capillary naevus) on the face, convulsions, typical intracranial calcification and some degree of mental retardation and hemiparesis. The clinical correlation of intractable seizures with the presence of bilateral intracranial disease has management and prognostic implications, thus making the presence of bilateral disease an important factor to all those involved in the management of the child with Sturge-Weber syndrome. Sturge-Weber syndrome (SWS), an uncommon condition that forms part of the group of phakomatoses, is also known as encephalotrigeminal angiomatosis or meningofacial angiomatosis. 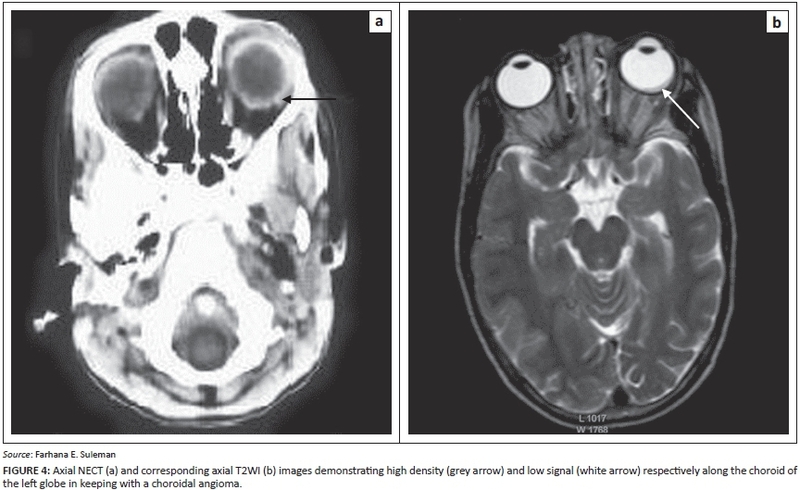 It is characterised by a congenital, usually unilateral, 'port-wine stain' (capillary naevus) affecting the face, convulsions, typical intracranial gyral calcification and tram tracking (Figure 1), some degree of mental retardation and hemiparesis.1,2 It is a progressive disorder, ultimately associated with profound neurological decline, the mechanism of which is incompletely understood. Diagnosis of SWS is usually made on clinical findings, and imaging is useful for confirming the diagnosis. 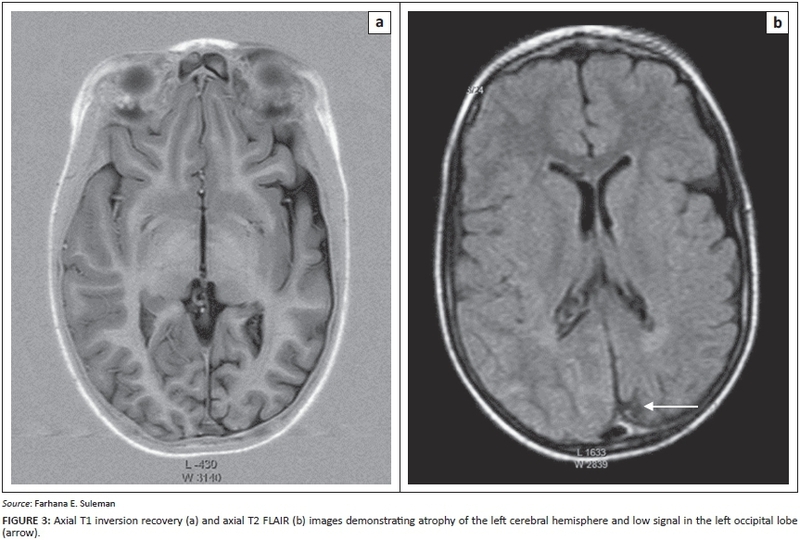 In severe cases, the seizures become resistant to medical treatment and surgery may be considered, thus making diagnostic imaging essential to define the full extent of the disease. 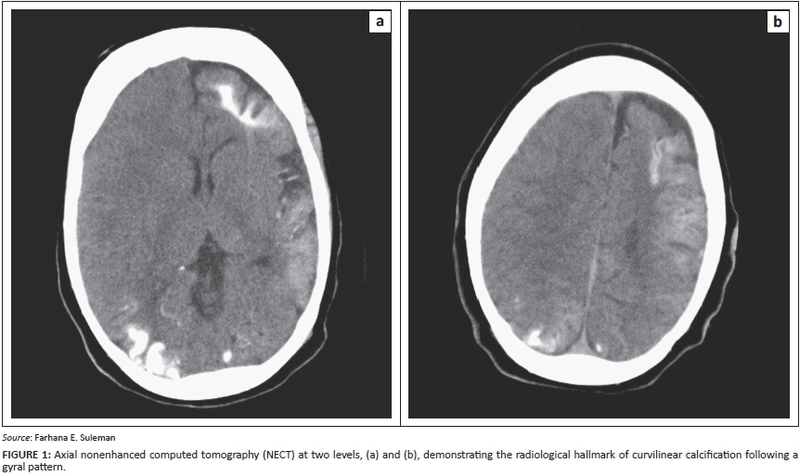 Unilateral cerebral hemisphere involvement eventually becomes atrophic, with dystrophic calcifications in most cases (Figure 3). Cranial asymmetry often results from the cerebral hemiatrophy. There is thickening of the ipsilateral calvarium and enlargement of the paranasal sinuses and mastoid air cells owing to the lack of brain growth on the affect side. About 30% of patients with SWS have angiomas of the choroid and sclera (Figure 4). The presence of choroidal angioma correlates with the presence of bilateral disease and the extent of facial involvement; it does not correlate with the size of the intracranial pial angioma. 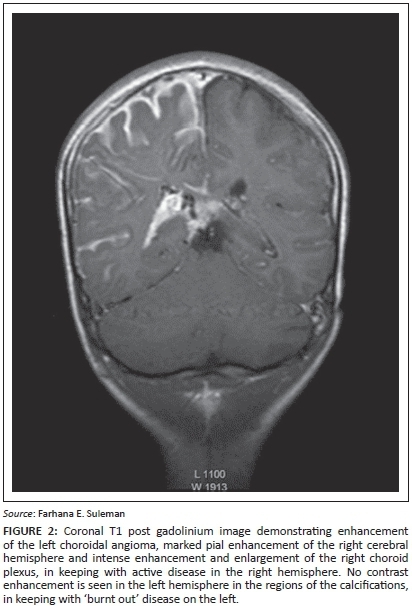 Bilateral intracranial calcification in SWS has been described only occasionally, and is not commonly referred to in the widely used radiology, neurology or paediatric texts. The clinical correlation of intractable seizures with the presence of bilateral intracranial disease has management and prognostic implications, thus making the presence of bilateral disease an important factor to all those involved in the management of the child with SWS. N.A. (University of Pretoria) wrote the original manuscript. J.S. (University of Pretoria) identified the cases and contributed to the literature review. F.E.S. (University of Pretoria) prepared the images and was responsible for final editing of the report.